Give your season’s greetings that personalized sparkle! 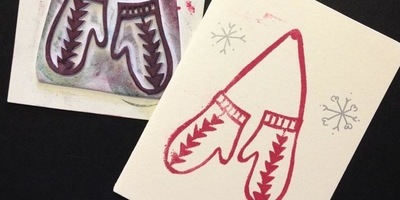 Make your own stamps for custom notecards, wrapping paper, notebooks, fabric, and more. We’ll craft these stamps from rubber erasers, corks, and styrofoam trays, with designs ranging from basic shapes to elaborate artworks. Put your imagination to work! All materials and tools provided. Registration is suggested. Space is limited. Amelia is a lifelong crafter and maker. She moved to Durham from New York City in 2011 and thinks every city should have a Scrap Exchange! In her previous life, she made theatrical props, and she loves finding the potential in every material. She enjoys ice cream, gardening, thrift stores, food, friendly people, and spending time with her 5 chickens.